Abigail Harding’s sister, Charlotte’s, letters have been sounding more and more melancholy and despite her assurances otherwise, Abigail fears that something is wrong with her sister. 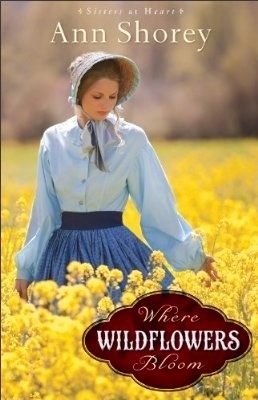 So, she hops on a train and a stagecoach and goes to visit her sister in Fort Laramie, Wyoming. What she finds isn’t what she expected. After an attempted robbery, foiled by a lieutenant on board, Abigail is convinced that Wyoming is no place for humans to live, and all she expects to happen during her visit is to be bored out of her mind. Lieutenant Ethan Bowles is determined to remain a bachelor for the rest of his life. Then he meets Abigail Harding and is shoved into seeing her at dinner by his best friend, who happens to be her brother-in-law. As he gets to know her he starts to think about a life that involves her. If only her almost fiancé wouldn’t keep getting in the way. Will their love grow? Will Abigail stay in Wyoming? Or will Abigail return to her almost fiancé and Vermont? Like my last review, I’ve never read a book by this author, however I have an unread book by her on my Kindle. So, again, I didn’t really know what to expect. Though, I was hoping for a great book just because of the cover. And I have news, the book live up to the cover! 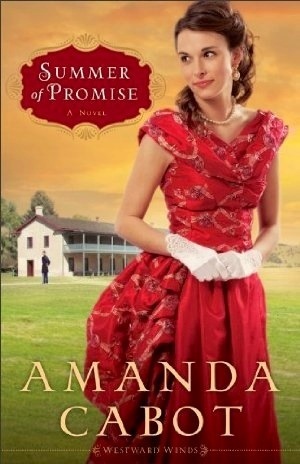 Amanda Cabot was a fantastic author with a great idea that was executed very well. It was a refreshing difference from the same ole same ole that seems to plague historical fiction books. A girl who doesn’t like anything to do with the army or guns falls in love with a crack shot lieutenant. I also really liked what the author decided would be the reason she didn’t like guns. This author has only written four books, but she has the skill of someone who has written many more. The attention to detail is incredible. I wasn’t left questioning anything about the oil or how it was written. I was captivated by the author’s gift of storytelling and amazing way of building realistic characters that tug on your heart strings. The romance in this book isn’t a passionate one, but it is built off of a friendship that slowly grows into love. It’s nice to see the romance building versus having it just hit the characters and the reader out of the blue. It was a nice mixture of subtle and obvious. There’s not a whole lot of kissing or anything like that but, it’s something that, surprisingly, isn’t missed. There’s a mixture of mystery in this book too. There’s a rash of robberies both to the stagecoaches but also to the actual fort. Ethan has to find out who is behind it. Like most mysteries I read I guess who does it. But that’s not the author’s fault, it’s just an unfortunate result of all the mystery books I love to read. Overall, I loved this book. There’s nothing I would change. 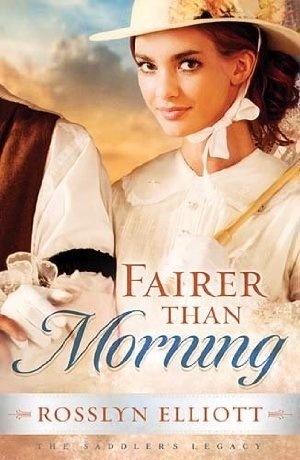 I think this book is perfect for a historical fiction reader or someone just likes a romance mixed with mystery. I give this book a four and a half out of five. I received this complimentary book from Revell in exchange for this review. All opinions expressed are my own. Faith Lindberg dreams of the day when she can convince her grandfather to travel west to Oregon to forget the reminders of war that took her father and brother from her- well as the Royal Baxter. She needs to convince her grandfather to sell the family mercantile and leave a town her family has called home for generations. Naturally, her grandfather refuses and she will do just about anything to get him to leave. When Royal finally returns Faith begins to hope that she and Royal would wed. But does Royal really love her or is he after something else? Will another man capture her heart or will Royal be the one she chooses? I don’t really know what I expected from this book. I have an unread Ann Shorey book on my Kindle, so I had no idea what to expect from this author. What this author gave me was a book with exquisite detail and characters with a mediocre storyline. Don’t get me wrong, I enjoyed the book, I just don’t feel like this book will stick out from the crowd of books I’ve read almost just like it. Though the characters are great, the storyline just isn’t something that you remember for a long time after. The romance is practically nonexistent. Faith spends most of the book being courted by Royal, whom nobody likes. All when Curt wants to court her, if only he could get up the nerve to ask. Royal charms her and there are a few kisses shared but other than that and sudden realizations by Faith about each man, the romance is sorely lacking for a book of the genre. I think I figured out what I don’t like about this book the most. Both Curt and Faith are complacent for most of the book. Curt would rather roll over and let Faith marry Royal instead of fight for her and Faith would rather cow away from conflict instead of stand up for herself. That’s not my idea of a good book. The worst part is that there was no explanation as to why they decided to take a stand. It was just an all of a sudden change that left you feeling as though the carpet got ripped out from under you. Like I said at the beginning of this review, the characters are great. Faith’s grandfather is opinionated and adds some conflict for the novel, while Rosemary is a character that is shunned because she was a nurse in the war. She provides value friendship and insight throughout the book for her brother and Faith. Every character is unique. However it seems almost like the author out more thought into the co-characters instead of the main characters. Overall, this book just falls short of the standards that I hold books to. I think the book is perfect for younger readers and readers who prefer their romances subtle. I give it three out of five. I received this complementary copy from Revell in exchange for this review. All opinions expressed are my own. Janessa McNeil’s husband, Dr. Brock McNeil, is a researcher and professor at Stanford University’s Department of Medicine. He specializes in tick borne diseases, especially Lyme disease. He’s known for his adamant denial that chronic Lyme exists, even when patients get sicker in front of his face. In an act of revenge and a twisted sense that he’s helping Lyme patients everywhere, a man plants a diseased tick, filled with not only Lyme but three coinfections, on Janessa McNeil. After which he states his demands, convince your husband to publicly reverse his statements on Lyme, or it’ll be there daughter next. With Janessa’s marriage on the rocks and her husband denying she even has Lyme, how is she supposed to change his mind? Particularly when he never admits when he’s wrong? 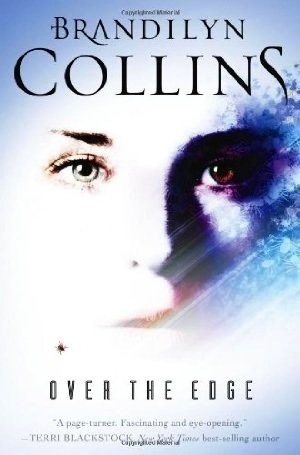 Brandilyn Collins is very good at writing suspense novels. I became a huge fan when she wrote Always Watching with her daughter. Though, she didn’t tag-team with her daughter in this book, she did an incredible job with this book. The author did extensive research and used her own experience with Lyme and it is very prevalent in the detail and facts about Lyme throughout the book. There is a ton of details on what Lyme does to your body as well as coinfections and and what is known as the Lyme Wars. It really delves into the trouble that most Lyme patients have an issue with, treatment. I never knew much about Lyme, let alone that it was so difficult to get properly treated. This book was a huge eye-opener on Lyme Disease. However, despite how many facts you stuff into one suspense novel, you still have to take into account the suspense part of the novel. The suspenseful and scary part of the novel is the fact that an unknown man plants a diseased tick on you, walking past your daughter’s bedroom to do so, without leaving a trace. Now, I can understand how that would freak you out, but just in general, the suspense is weak. The suspense is mostly on the back burner. The main chunk of the book seems to be about Janessa’s illness and convincing her husband she actually has it, not about the mystery man, though he is mentioned quite often. In my opinion a suspense book should be a majority of teeth-biting suspense. This book was disappointment in that area. Despite that, the book is well written and the author decided to not really give you any substantial hints as to who the mystery man was until about three quarters of the way through the book. I appreciated that because it delayed my figuring it out for most of the book. But, like the last suspense book that I read, I did figure it out. I don’t really like to do that, but I think with how much I like suspense and how many I’ve read it’ll probably be a rare book when I don’t guess correctly. The author kind of made the husband the more prevalent villain than the actual villain. Almost to the point that it was literally unbelievable. Her husband is overly harsh and cruel, but it worked wit who was portrayed to be, I just wish that he was more realistic. Overall, this book is great if you want to learn more about Lyme and Lyme sufferers, but if your looking for a strong suspense you might want to keep looking. It’s perfect for anyone wants a medical suspense, heavy on medical and less on suspense. I give it a three and a half out of five. I received this complimentary book for this review. All opinions expressed are my own. Paige and Erin Forrester are back and this time they’re traveling to London, England with their show On the Runway to film interviews and to have Paige guest star in a TV show there. If only it could go that smoothly. With a tip-off from Paige herself about their location and horrendous rumors swirling around the gossip mill, this trip across the pond is a recipe for disaster. Naturally, it’s now up to Erin to find a way to keep everything together. But, with everything going on lately, Erin is starting whether or not she’s enabling her sister and is getting tired of being the one to always repair her sister’s mistakes. Will the show fall apart or will Erin keep it all together? Melody Carlson is my favorite young adult writer for a reason. She’s one of the few authors I know that can one of the shallowest subjects in the world, high fashion, and make it deep and give facts about things other than fashion. The author chose a perfect subject for teen girls because what teenaged girl doesn’t like clothing and shoes? But she adds deep thoughts and makes you think. Erin is the main character outlet for the deepness of the book but like all of us she is flawed and sometimes has a skewed view of things. It makes her more realistic and endearing. To counteract this the author adds friends who are as down-to-earth as she is. They offer her a third party view to her family and mainly her sister. Naturally, with the subject matter, there has to be someone on the shallow end of the spectrum. That person is Erin’s sister, Paige. Paige is the older sister, yet she acts like the youngest. She must have her way and if she doesn’t get it, she’ll do just about anything to get it, even if all that is is the silent treatment. This causes conflict between everyone about her. Unlike most teen books, Erin doesn’t feel the need to be in a relationship, so she isn’t. Not for lack of trying on the guys’ part, though. Erin decided that she wants to put the show first and to back-off on having a boyfriend at tis time in her life. However, that doesn’t mean that there isn’t romance. Both the sisters are trying not to be wooed by more than one man. It’s interesting to wonder who each one are going to pick, or at least Erin, since she’s the one on the fence as to which on she likes the most. This author is a master at teen fiction. She’s written over two hundred book for young adults and it shows in the story telling and how well she understands the teen mind. She craft-fully incorporates faith into every story and she makes every story seem real every main character lovable and realistic. I haven’t read one of her books that I haven’t liked and I don’t think I will very often if at all. 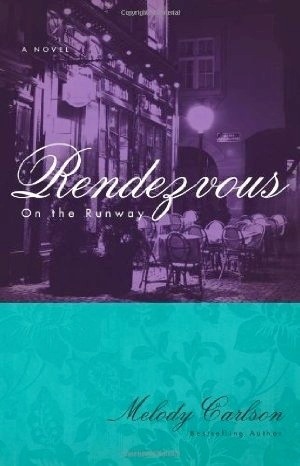 Overall, a great surprisingly deep book on fashion for young adults. I fully recommend this, and any of her others, to all teen girls. I give this book three and a half out of five. I received this book from Zondervan in order for this review. All the opinions expressed are my own. Parker James is a struggling singer/songwriter and the music business turns deadly for her when a girl is killed at her desk at a busy recording studio. Parker is drawn into the mystery where nothing is as she seems and she realizes that her life might be at risk. She needs the help of her brother and the support of her whole family to solve this mystery so she can breath easy again. Unfortunately, the case is long and arduous and covered in a tangle of cobwebs that show that just because a person claims to be Christian doesn’t mean that they don’t have skeletons in their closet. I’m a huge fan of Terri Blackstock and her Up All Night Fiction, so naturally, when this book arrived in the mail I was so excited to dig in and devour this book. Unfortunately I had to wait and fulfill other obligations before I could read this book. But, it finally moved to the top of the list and I got to read the book that I was so looking forward to. Mrs. Blackstock didn’t disappoint my expectations with this book. 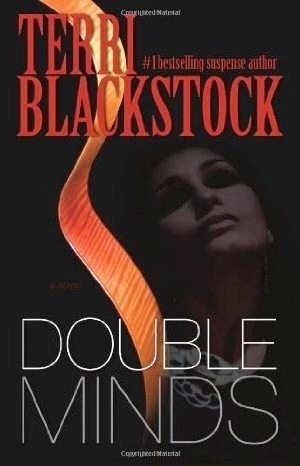 She’s one of my favorite suspense writers so my expectations were pretty high. One thing that did disappoint was the mystery. I guessed who did it about a third of the way through the book. A little disappointing. However, despite that fact, this book kept me on the edge of my seat and showed just how fitting her saying, Up All Night Fiction, really was. With creepy phone calls, stalkers, break-ins, and a tangled web of secrets that doesn’t want to be unraveled this author will grip you and won’t let you go until you turn the very last page. I won’t say who the murderer is, but I will tell you that if you don’t guess who it is you’ll be shocked as to who it is. The author was very clever in that fact. She chose a killer that is the least likely to be one. It shocks you, not just the fact the they are the killer, but also why they killed and how they feel about it now. It was just genius. This book is all about the mystery and suspense, so unlike all the books I’ve read in a while, it has no romance in it at all. It’s nice for a change. The author wasn’t forcing any romances when they weren’t appropriate and where they didn’t belong. It shows just how long this author has done this. This book is extremely well written and the characters have appropriate depth. The author is a master of deception when it comes to her books. Characters that seem nice really aren’t, characters say one thing but mean another. It’s all executed really well. The story line is interesting in a good way. Christian music industry gone wrong. It’s well executed well too. The story doesn’t struggle and starts out with a murder. It’s fast paced and doesn’t slow down. It’s a wonderfully made suspense that leaves a knot in your stomach until the very last page. Overall, wonderfully made suspense, though the mystery does lack. I recommend this to any suspense lover. I give this book four out of five. I received this book from Zondervan in order for this review. All opinions expressed are my own. After Ann Miller is forced to decline a marriage proposal from her poetic suitor, Eli, she is crushed to realize that he is courting another girl. So, she decides to go with her father to Pittsburgh, but what happens there will turn her life upside-down. Will Hanby is trudging through a terrible apprenticeship and just trying to get through the remaining two years so he can finally leave. Then, he meets the Millers. They give him hope he never had before and show him who God really is. When he flees his abusive master, he turns to the Millers for shelter. What he and Ann don’t expect is the spark of attraction that flies between them. But will the spark turn Into a flame or will it fizzle with the danger that he brings to them? I don’t really know what I expected from this story, I think I expected this book to be the typical cookie-cutter historical romance. However, cookie-cutter this book is not. How many books have you read that include a raggedy, sickly thin indentured servant that falls in love with the daughter of saddler slash circuit preacher? My guess is not that many if any at all. This story starts out with Ann getting proposed to, at fifteen, by Eli. She has to decline, much as she wants to say yes, because her father says she has to wait until she is eighteen. His reasoning is that her mother admitted that she would have made a mistake had she married the first man to propose to her. He doesn’t want her to make a mistake and in the end his reasoning is spot on but in Ann’s fifteen year old brain she refuses to admit that he’s right for her to wait. After Ann, it shifts to Will, who at the time, is just signing on as an apprentice for Master Good. Just don’t let the name fool you, he is anything but good. He barely feeds them and what he does is scraps. He hits them, make them sleep in a cold barn and makes them work harder than horses. Too bad Will didn’t realize this before he signed on. One of my favorite parts of a book is learning new words to add to my vocabulary. This author utilized many of the words used in the early nineteenth century and my dictionary got some use with this book. The author is also great her use of words. She shows the reader exactly what Pittsburgh in the early nineteenth century looked and smelled like. She also is great at painting pictures of the countryside outside Pittsburgh. The author drags you into the story with her incredible descriptions. The romance in this book isn’t really a huge part. I think the majority of the story is supposed to be about the conversion of Will and Ann trying to figure out which one of the three men she really loves. For some reason I was more interested about how Will was going to get out of his contract permanently than the romance. I’m not really sure if that’s a good thing or a bad thing. There’s a touch of suspense that carries through most of the book, however it’s not too overwhelming and it’s subtle enough to where you don’t dwell on it every second, but enough to where it leaves your stomach in a knot when it comes up. Overall, despite the lackluster romance, I enjoyed this book immensely and wouldn’t change anything about it. It fits together too perfectly. It’s perfect for those that want a unique, dramatic romance with a sprinkle of suspense. I give it four and a half out of five. I received this book from Thomas Nelson and Net Galley for this review. All opinions expressed are my own. One of the world’s most dangerous enemies is trying to destroy America. His plan, to destroy America’s values and watch the country self-destruct. To do that he has to back a man who has created a whole new religion that tells people exactly what they want to hear. 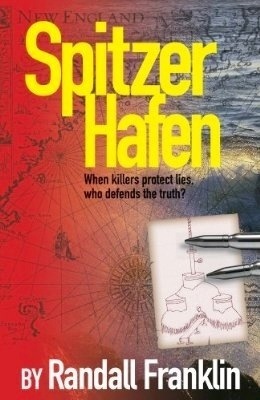 Unfortunately for them, there are two missionaries broadcasting a radio show from a tiny island called Spitzer Hafen. An island heavily guarded and impenetrable. Bit their going to try and assassinate them anyway. Little do they know that they have a friend with them. A man so stealthy and deadly that the KGB refused to believe that he existed. He’s also the last of the Vectors. My first impression of this book is, busy. There are so many characters, that there needs to be a whole page before the book even begins detailing who everyone is. Fortunately, after some get killed as some just disappear out of the story all together, the character list becomes a manageable dozen or so characters. As for character development, not great. The characters really don’t have much dimension. Back story is used on several occasions but it never really shows an emotional side to anything except with Rachel and even then it’s weak. I’m also a compulsive proofreader when I read. I unintentionally look for blatant errors when I read, and most of the time I don’t find anything and when I do it’s usually an honest mistake. This book was chock full of them, however. Whole words were missing, letters were missing from words. It was a disaster. It made reading this book a struggle just to figure what the author was trying to say. This author is also not very good at showing. He would rather tell you instead of let you come to the conclusion yourself. It takes away from the experience of reading a book. Odds are you don’t have to guess what’s going happen next because the author will tell you. The idea of this story is actually a unique and awesome one. However, this story just wasn’t executed properly. It was a little jumbled, kind of like this review I guess. The story works in a funky, hard to follow way. There’s some action but it’s few and far between. The majority of the second half of the book is a watered down and weak romance. It’s not really a romance just a meeting, a date or two, and a marriage. Not really a fulfilling romance. Overall, I started this book with high hopes and they basically got dashed against the rocks. I don’t really know who this book is best for, but if curiosity overcomes you and you decide to read this book, I’d be interested of your opinion. I give it one and a half out of five. I received this book free from the publisher and bookcrash for this review. All opinions expressed are my own.